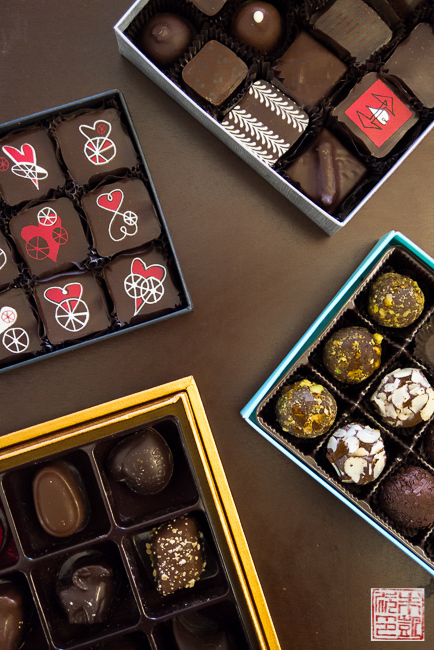 Michael Recchiuti has long been one of my favorite chocolatiers – his truffles and chocolate bars are impeccably made and they’re beautifully decorated. I love his seasonal offerings – he routinely comes out with special flavors or limited-run unique items. 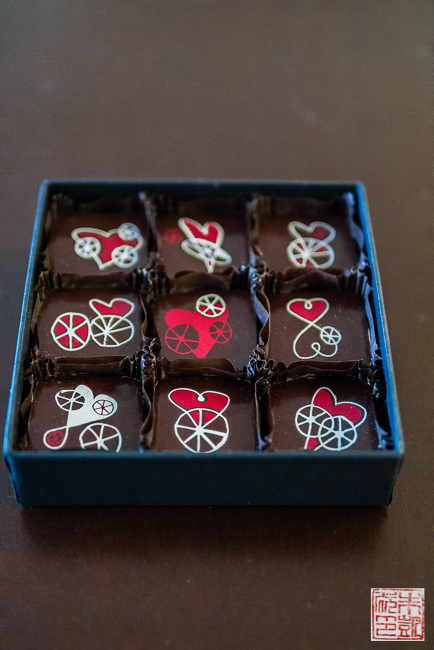 For Valentine’s Day, I’m in love with his Hearts in Motion Box, featuring nine of his signature burnt caramel truffles with a chic heart motif. 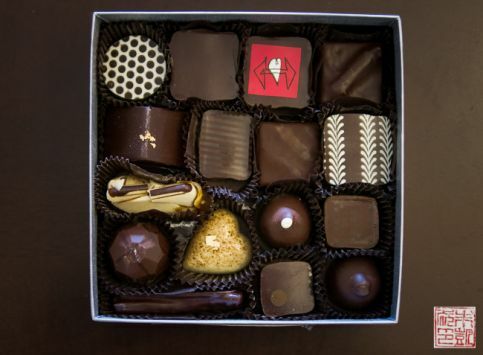 Or, if you want a classic selection, his Amour Box is a sixteen piece collection, specially gussied up for Valentine’s Day. Hearts in Motion – love the whimsical designs. Michael’s burnt caramel truffle is smoky, intense, and addictive. 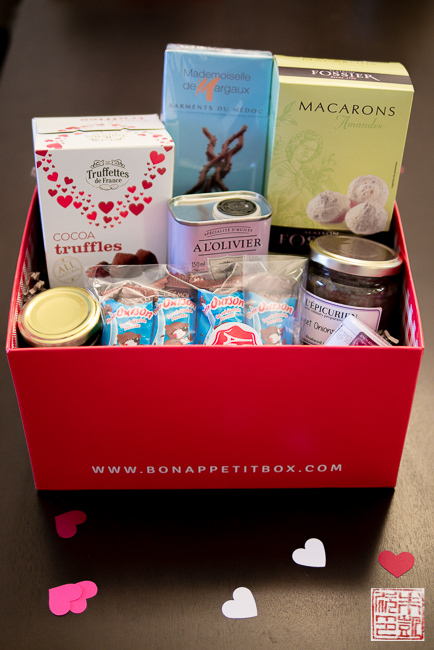 The Amour Box contains sixteen of Michael’s bestselling flavors – from burnt caramel to lemon verbena (my personal favorite) to Piedmont hazelnut to lavender vanilla. For me, Michael’s chocolates have always been unusual and sophisticated without ever falling on the wrong side of trendy. Plus, his packaging is understated luxe: fine-grained boxes, heavy, rich ribbon – these are boxes that will impress any lucky recipient. I’m always excited to discover new local food artisans. TinyB Chocolate specializes in brigadeiros, a popular Brazilian sweet. Made from cocoa powder, condensed milk, and cream, they’re very similar to fudge balls but have their own unique taste. Chef Renata learned how to make brigadeiros and other confections from her mother in Brazil, and decided to carry on the tradition here in San Franciscio. TinyB Chocolate makes several variations including dark chocolate and pistachio, coconut and cream, and dark chocolate and almonds. 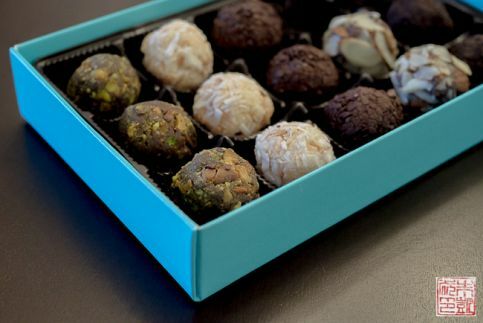 These bite-sized balls are soft, slightly chewy, and deeply chocolatey – much like a truffle. 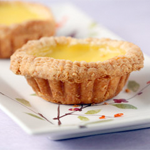 The condensed milk gives them a unique richness, and I like the flavor combinations, especially the coconut and cream. 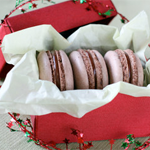 The fifteen-piece box is the perfect size for gift-giving; you might even be able to snag one for yourself. 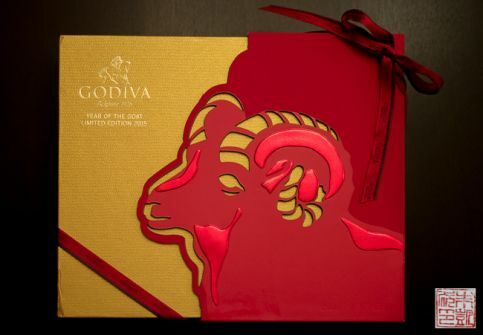 Godiva is one of the popular heavy-hitters when it comes to Valentine’s Day, but I really like that they still constantly come up with new and unique creations every year to keep things fresh. 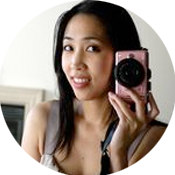 This year they have a special Chinese New Year collection – I know, it’s not technically a Valentine’s Day box, but this year, Chinese New Year falls on February 19, so I’m going to roll this into this roundup because the timing is so close. And look at that beautiful red and gold box! Definitely the most striking of all the boxes I’ve seen! The CNY box features fourteen chocolates from their traditional lineup, and six chocolates in three flavors newly created for the upcoming Year of the Goat: Chrysanthemum and Ginger, Gui Flower and Ginseng, and Jasmine and Angelica Root. 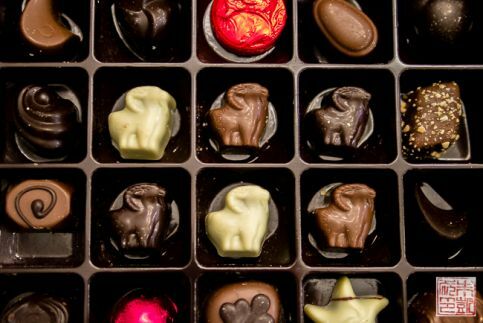 These special flavors are cast in these adorable goat shapes – almost too cute to eat but I did try them out and my favorite was the Gui Flower and Ginseng – sweet milk chocolate with just a hint of heat from the ginseng. A beautiful and very special box. If you’re looking for a gift that keeps on giving, there are some new subscription boxes on the scene. 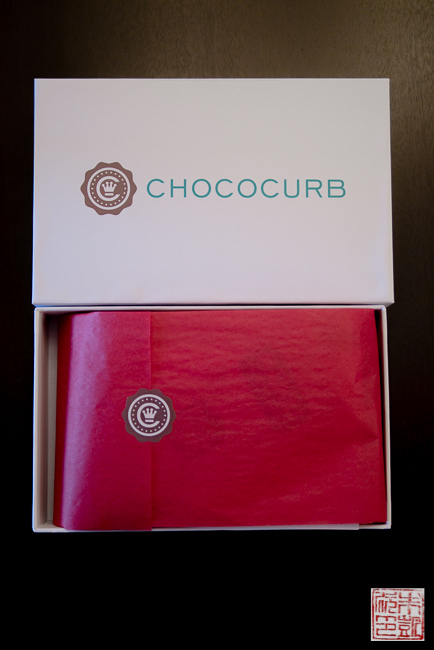 Chococurb is a new chocolate subscription service that delivers 5 to 7 high-end chocolate bars every month for you to explore and savor. With the craft chocolate world continuing to grow by leaps and bounds, it’s hard to keep up with all the great new chocolate coming out all the time, and I like being surprised with some new bars I haven’t heard of before. Pacari’s Merken Chile bar – Organic Ecuadorian chocolate spiced up with chili. Theo Chocolate Cinnamon Love Crunch – red hot cinnamon brittle in 70% dark chocolate. Marou Ba Ria 76% – Possibly the most exotic bar in the set, made with cacao from the Ba Ria province in Vietnam. 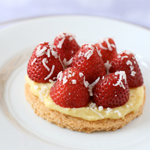 Divine Chocolate White Chocolate with Strawberries – pure white chocolate layered with pieces of strawberry crisp. Fran’s Smoked Salt Caramels in Milk Chocolate – soft butter caramels dipped in 38% milk chocolate and topped with smoked sea salt. 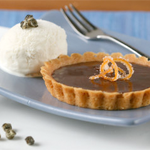 Taza Chocolate Cinnamon Chocolate Mexicano – a disc of stone ground Dominican chocolate with cinnamon. The process of grinding the cacao with stone mills is a Oaxacan tradition and gives the chocolate a rustic, rough texture. I thought the choices were very creative and fitting to the Valentine’s theme – red and pink and white, red hots, cinnamon, and chili. Well done! I’ve heard of all these chocolate makers before but I haven’t tried these particular bars, which is great because it’s next to impossible to try every bar a particular brand makes, and I often end up just buying the same one or two bars I’ve already tried. Whether as a one time gift or as a longer subscription, Chococurb has done a nice job of curating some interesting, quality chocolate bars. 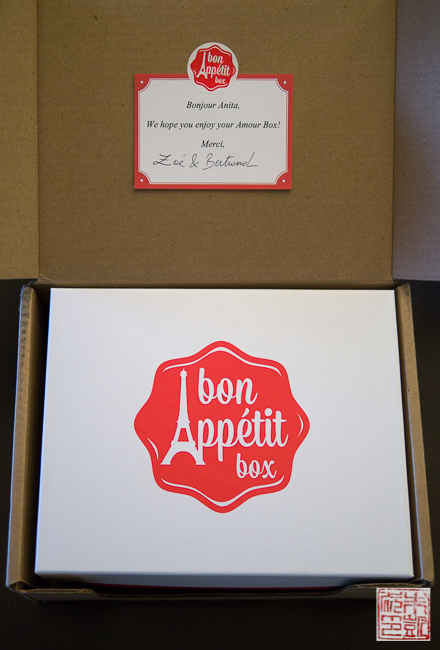 Finally, if you’re looking to go just a bit beyond chocolate, The Bon Appétit box is a gourmet subscription box started by two French food experts, Zoé and Bertrand. 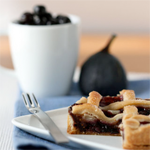 Each month brings a selection of sweet and savory delicacies centered around a region of France or a particular tradition like Christmas or le pique-nique. 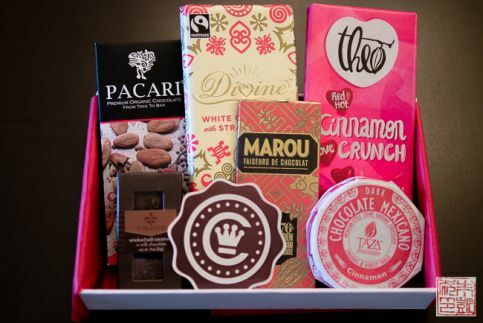 They also have single-theme boxes perfect for gift-giving, like the Amour Box, for Valentine’s Day. I was particularly impressed with the packaging – this is definitely one of the most impressive subscription boxes I’ve gotten, and I love the little extras like the personalized card and the informational cards giving background information on the various items in the box. 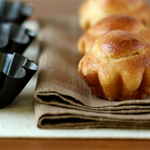 Truffettes de France- Classic French truffles rolled in cocoa powder – no Valentine’s Day complete without some chocolate! 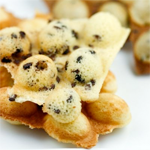 Sarments de Médoc – chocolate “twigs” laced with orange – these adorable sweets are meant to mimic the shape of grapevines. 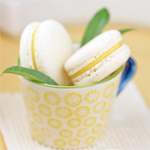 Macarons a l’Amande – these almond macarons from Reims are a more rustic version but equally delicious version of of the macarons you see in Parisian bakeries. Lavender infused Olive Oil – the classic flower of Provence lends its distinctive flavor to olive oil. 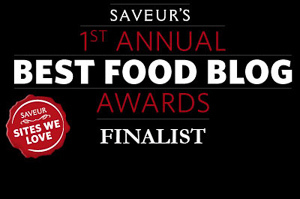 Tapenade aux Olives Noires – Black olive tapenade from Opio, a Provençal favorite. The Amour Box comes with a recipe card suggesting how to cook with this spread. Petit Ourson – milk chocolate teddy bear-shaped chocolates filled with marshmallow cream – the French have their novelty candy classics as well. Sweet Onions Confit – a very French delight from the South of France, wonderful on toast with goat cheese as an appetizer. Cherry Blossom Hard Candies – these traditional hard candies from Nantes are made by a century-old confectioner and are elegant and sweet. 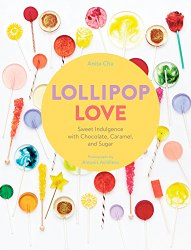 I thought this was a wonderful selection of nibbles, sweets and cooking items; although I drawn to all the sweet things first I was also intrigued by the savory ones and was inspired to have a French-themed meal soon. The informational cards and other extras really make this a complete experience – a fabulous gift for the Francophile or foodie in your life. 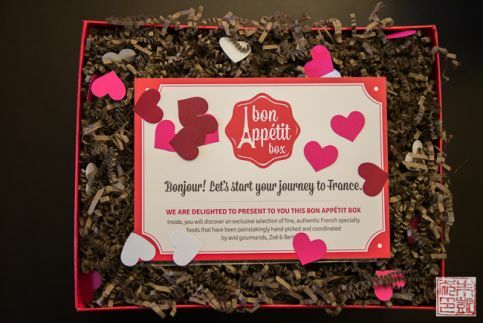 Hope you’re inspired to get something beyond just the basic bonbons for Valentine’s Day! 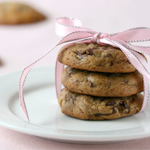 I’ll be back in a day with a recipe of my own for this up coming special day! Disclaimer: I received these products for review. All opinions in the post are my own. oh, goodness… Love it all.. you can never go wrong with Godiva… I am a chocolateholic so I appreciate this post \! 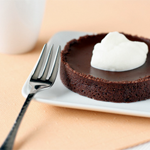 Im a chocolate fanatic, this looks delish!! Those are so cute. I prefer the little squares. Adorable. Have a lovely Tuesday. well that is quite a selection of delicious options for Valentines Day! I think this post must have been incredibly fun to write. 😀 I don’t even know what I’d do with myself if I had all those amazing chocolates! Those Hearts in Motion ones are really cute and everything else looks great, too. I love chocolate in any form and everything looks just fantastic. oh yummy i love chocolate and already salivating throughout this post, thanks. What a lovely collection of chocolate choices for Valentine’s Day. I’d be happy to receive (or give) any one of these! if it’s chocolate, I’m all in. And I love all these choices especially Godiva! I want ALL THE CHOCOLATE! Seriously, these all sound amazing, I wouldn’t know how to choose…but I’ll start with that burnt caramel chocolate. Forget the flowers chocolate is definitely the way to my heart! What a gorgeous boxes of chocolates.